Schedule manager for the X-10 model CP290 computer interface. Is there a better alternative to xMaster? Is xMaster really the best app in Home Inventory category? Will xMaster work good on macOS 10.13.4? xMaster is a schedule manager for the X-10 model CP290 computer interface. 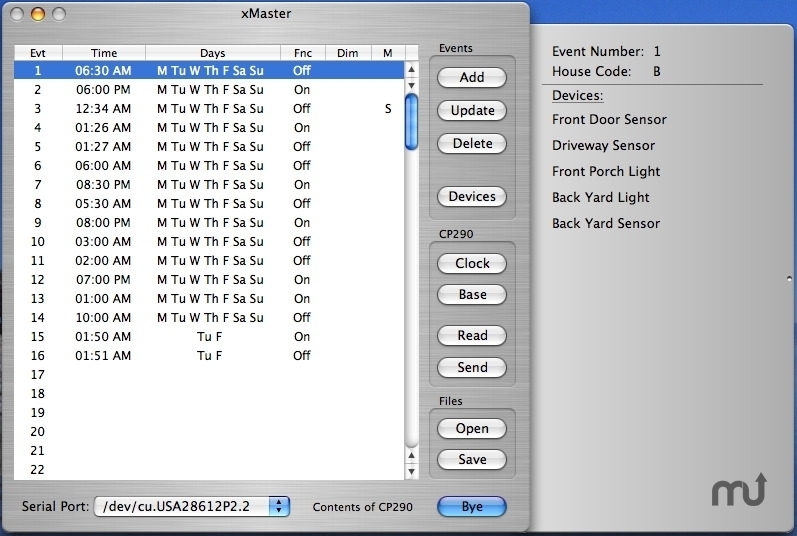 Use xMaster to create and edit schedules of events that can be stored in the CP290's memory, or saved to disk. Retrieve events from the CP290. Have different schedules automatically loaded to the CP290 on specific dates. Automatically adjust event times relative to sunrise / sunset. Other features: set CP290 Clock, set Base House Code, and run CP290 Self-Test. Widened Event Number column in Event list. Three digit event numbers were not displaying in OS X 10.11 El Capitan due to the new system font. xMaster needs a review. Be the first to review this app and get the discussion started! xMaster needs a rating. Be the first to rate this app and get the discussion started!